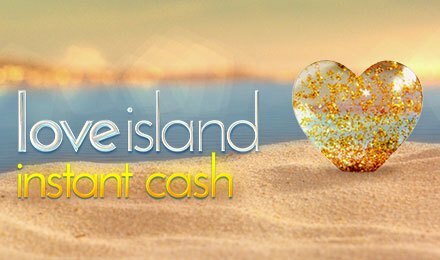 IWG brings you Love Island Instant Cash at Moon Games. Based on the British reality show, Love Island, it is a highly entertaining instant-win game. It is packed with 3 types of games and a Bonus Wheel. Get the chance to trigger a maximum payout of £250,000! Don’t forget your sunglasses, swimsuit and sunscreen to enjoy a great day at the beach. Make the most of this game on any type of device at Moon Games! Start enjoying Love Island Instant Cash by adjusting your stake. Once you are ready, click on the Spin button. Match 3 or more symbols on their respective lines to trigger wins. You can reveal the prizes one at a time or simply click on the Reveal All button to speed things up. During Game 1 on Love Island Instant Cash, you are presented with different symbols like diamonds, hashtags, gold bars, stars, slippers or mobile phones. Match 2 symbols in a column to win the prize displayed. The various payouts are £1, £5, £30 or a whopping £10,000. During the second game, different values like £1, £2, £10, £25 or £100 are displayed. Your goal is to match 3 of them to win a prize. The third game consists of different symbols like the mobile phone, lips, stacks of cash or gold bar. The aim is to reveal a lucky symbol to trigger a win. If you land the Lucky Wheel symbol, the Bonus game is triggered. The Bonus game on Love Island Instant Cash consists of a Bonus Wheel. Simply spin the wheel and earn the prize on which it lands. Be ready for some instant wins on Love Island Instant Cash at Moon Games. Make the most of it. Good luck!